Campus Party was the most important Tech & Gaming conference in Ecuador in 2015. Every year it gathers thousands of tech saavy people, "geeks", gamers and the big brands are there to blow their minds. Movistar wanted to have a memorable experience that made users live the speed of a 4G LTE network. The people that come to the Campus Party are hard to surprise and amaze. They have been gaming for years, they have the latests devices and apps, they live and breathe innovation, technology and games. So, how do you genuinly surpise them? That was the challenge. After researching, analyzing references of tech events around the world, studying the audience (I consider myself one of them) and thinking about what they haven´t seen, I realized that the best solution was: NOTHING. You read right, nothing. Let me elaborate as follows. Gamers, geeks, tech saavy people, however you want to call them, they tend to be updated in the new tendencies, games and digital innovation. If there is something new and amazing out there, most likely they have already tried it or own it. I realized we needed to show them an experience they have never seen before, something they might feel familiar but they could not be masters at it. I wanted to make them game like they never had. Gaming through a PC, a console or even a smartphone is how the Campus Party audience spend their leisure time. They own or have tried different kinds of games, from indie platformers to Triple A massive multiplayer games. They have seen it all. Movistar did not have a chance trying to create a game that could beat any of the ones these gamers were used to play. 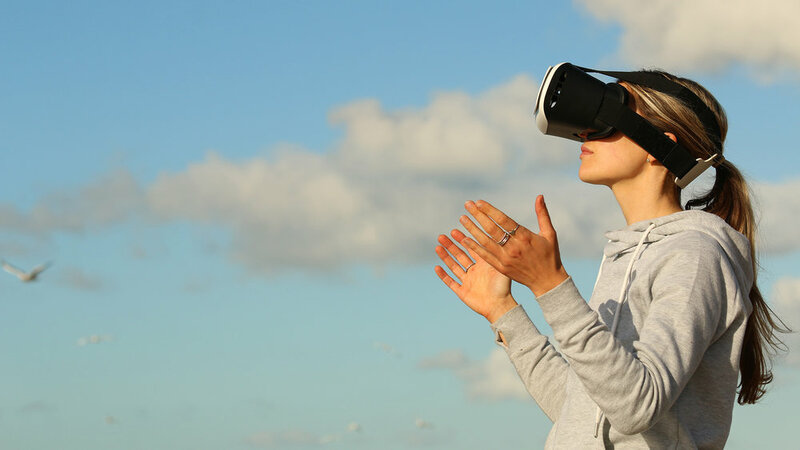 Virtual reality and Augmented Reality are still in very early stages, but there are games, videos, and experiences that anyone can access. The conference audience would not be the exception. 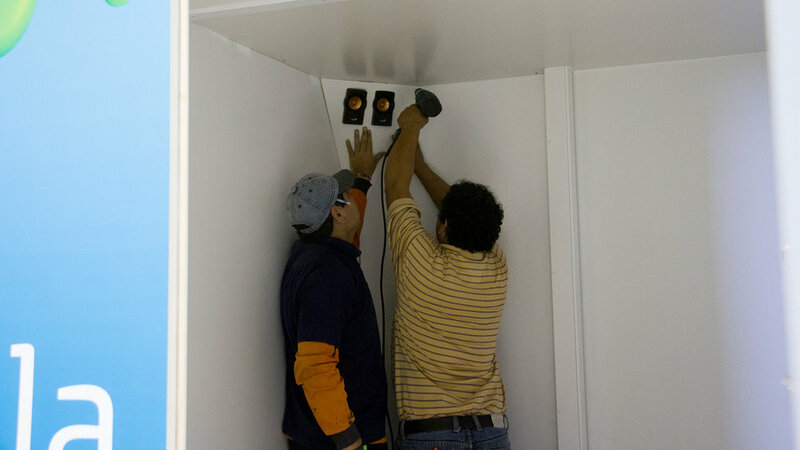 Many brands in Ecuador had alredy been experimenting with these technologies and they have shown what they can do. Inspired in some Physical Computing projects I participated during my Masters of Interaction Design, I came up with the idea of the 4G LTE Experience BOX. Literally an (almost) empty box where they could not see anything, but experienced gaming through their listening and reflexes. The first step for the player was to select the mission, there were 3 kinds of space battle related missions to choose from. 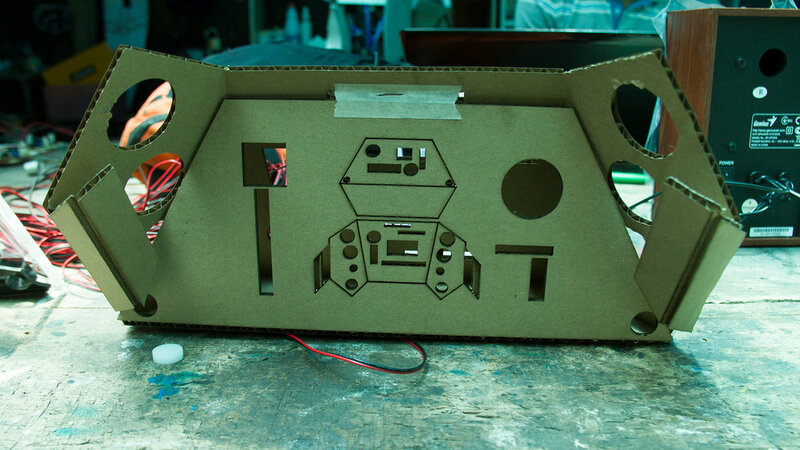 Each mission would have its own wireless controller that needed to be activated to light a Infrared light. Inside the box there were 8 High Definition speakers located all around. Below each speaker, there was also a Infrared receptor that would detect if the controller infrared light was activated on its direction. When the door closes and the game starts, the player would be in complete darkness and would only hear the game´s sound effects. The missions would involve enemies aproaching from random directions shooting and what not. The player would have to point the controller towards the exact direction of the sound and activate it. If done correctly, the player would win points. The result: It was a massive hit! 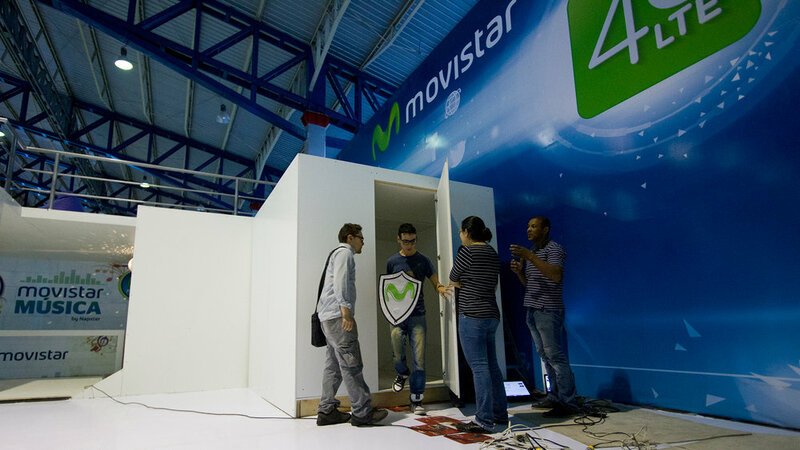 The 4G LTE Experience Box by Movistar was the most visited stand of the whole 3-day tech conference. People would line up to play it over and over again. They commented they never played something like it before and found it quite challenging even though they would describe themselves as pro gamers. The intearction design process was amazingly fun. 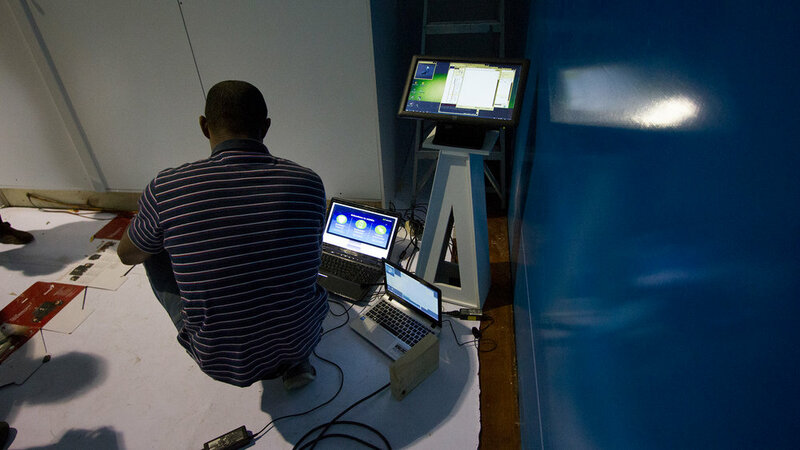 From designing the artifacts, to building the room and programing the games. I colaborated with electronic engineers, architects, graphic designers, industrial designers, sound producers, event managers, the client and many more people. This is a timelapse I created of the in-situ brading process of the box exterior.